Wants to stay on or near the beach, deep sea fishing, other fun stuff. 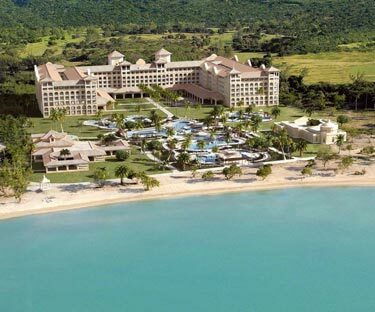 * Located on the beach, on 2400 acres! Adrenaline pumping adventure! Race the rapids in this exhilarating white water experience. During the journey, your raft guide will provide full details about the characteristics of the natural environment in and around the area. At the end of the rafting trip, you can get dry and change clothes before enjoying a hot lunch on the river bank. Instruction and safety equipment provided. Includes: Transportation, bilingual guide/instructor, lunch and refreshments. Recommendations: Swimsuit or light comfortable shorts, sunblock, strap water sandals or tennis shoes, change of clothes, towel, camera. Located at the foot of Rincón de la Vieja, one of Costa Rica’s most active volcanoes, this popular full day tour includes the canopy tour, a thrilling waterslide and a visit via horseback or tractor to the waterfall and to the hot springs spa. Throughout your day you’ll also be able to enjoy the peacefulness of this naturally stunning forest. A delicious buffet lunch full of traditional Costa Rican specialties is included at the Buena Vista Lodge. * The Canopy Tour: Actually more an entertainment more than a sport. It is a voyage through and over the trees of a Tropical Humid Forest where you will be able to appreciate the diversity that exists at these heights. * Hot Springs and Spa: Hot Spring Spa is a gorgeous hidden paradise surrounded by forest, streams, and wildlife. The spa includes five spacious hot spring pools, each of which has a different temperature. In addition to the pools, there is a beautiful sauna constructed of rocks where you can relax and soak up the heat. Also available at this luxurious spa you can revitalize your skin with volcanic mud. * Waterslide: The waterslide is the only one of its kind in Costa Rica constructed totally inside the forest. It is 1365 ft. long and guarantees an exciting experience. Includes: Transportation, bilingual guide, entrance fees, lunch. Recommendations: Tennis/athletic shoes, light shirt, long pants, camera, binoculars, swimsuit, sunscreen and a change of clothing. 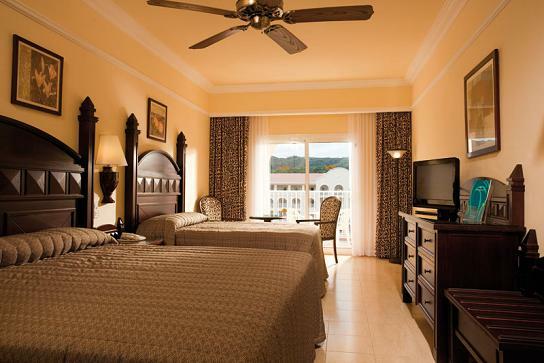 * The Doubletree Resort by Hilton, is the closest beach resort to San Jose, Costa Rica's capital city. Whether you come from the Central Valley or from Guanacaste, both drives are especially scenic and give a sense of what the natural surroundings are like. 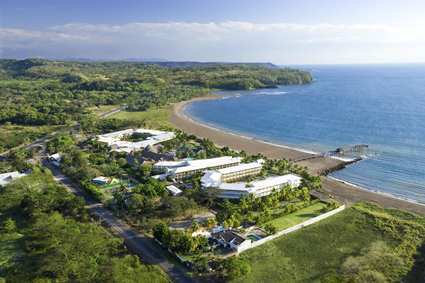 * The resort is situated on a long, volcanic sand beach in Puntarenas. * Puntarenas is known for its volcanic black -sand beaches and close proximity to San Jose. * Puntarenas, Costa Rica’s largest province, is known for its great fishing. The Vista Los Sueños Canopy is a project designed not only as an extreme adventure, but a way to enjoy nature without harming the environment; the area you'll visit boasts spectacular views of the Herradura Bay and Island, as well as the Nicoya Gulf. Within the property, you will have the opportunity to view the scarlet macaws, chestnut mandible toucans and white-face monkeys. The property rests on 80 acres of land... 50% of which is primary forest, where the canopy trail is located. The adventure starts on a 15 minute ride aboard on a specially designed 40 passenger tractor. Once you arrive to the top of the mountain you will descend to the bottom via a series of zip lines, including 15 platforms and 14 cables with a total cable distance of 3.8 miles including the longest cable in the area of 2400 ft! This full day adventure includes a journey into the very remote back country of the Rio Savegre for a 3 hour guided rafting trip with class II / III rapids. There are great swimming holes and a large variety of birds to observe. Enjoy a scenic drive to the little town of Artola for an amazing, unforgettable experience! After instruction from extensively trained guides, the tour begins with a short hike to the first platform. Fly through the tree tops of the Forest via steel cables. You will be able to experience the various levels of the canopy as you swing/ glide from tree to tree. During the tour you will come across a walking bridge between two platforms, this is a truly an exhilarating and exciting experience. If you are lucky, even the howler monkeys will be your company during a part of these canopy travels. "June is one of the wetter months all over Costa Rica and particularly for the Pacific coast. However, the majority of the rain falls as afternoon or evening showers,"
"Unlike the USA’s four seasons (Spring, Summer, Fall, Winter), Costa Rica has only two seasons; The Dry Season (December to April) and The Rainy Season (May to November). In the rainy season the temperature in the City (San Jose) ranges from 60-80 degrees, rain can be expected on and off every afternoon, however the mornings are extremely sunny with mostly clear skies, a definate plus for morning people. If you head to the beaches you will find warmer weather and far less rain, typically highs of 90 and lows of 70. " "We were in Costa Rica last July, during the rainy/green season. It rained every day while we were inland (San Jose, La Fortuna and Monteverde) and one of the days we were at the beach at Manuel Antonio (Pacific coast.) It usually rained in the afternoon/evening and there were times it didn't stop. A couple of advantages to traveling during the green season are that it is a gorgeous time to travel....very, well, green, and beautiful. Prices also tend to be cheaper. We had three gorgeous rain free days at the beach, so what Angela said above held true for us. We didn't let the rain slow us down....if they choose to go then, make sure they invest in GOOD rain gear. Sturdy, water tolerant rain shoes (sport sandals) and waterPROOF (as opposed to waterrepellant....hubby learned the hard way) ponchos or jackets and clothes that dry quickly." All United States citizens are required to present a valid passport. Time Zone: Central Standard Time; Daylight Saving Time is not observed. _Communication: Calling from the U.S. dial 011 + 506 + local number. Internet access is available at most hotels and internet cafes. Contact your cell phone provider about coverage. Local Customs: Legal gambling / drinking age is 18. Restaurant tipping is 15 to 20 percent for good service. Local sales tax is 13 percent and should not be mistaken for gratuity. Porters should get approximately US$1.00 per bag; hotel maids should get US$.50 to US$1.00 per day. Taxi drivers can get 10-15% of the fare. Don’t forget to tip your guides! Document Backup: Be Prepared with Instantly Accessible Copies of Your Travel Documents. You can easily lose three or four days of your vacation trying to replace lost or stolen travel documents. You should minimally have copies of your passport, driver’s license, and any airline, or bus tickets (or the e-ticket confirmation information), and you might also consider copies of hotel and tour reservations, car rental agreements, your birth certificate and social security card, travelers checks and credit cards. Scan in copies to a USB micro drive, CD, or even attach them to an e-mail to yourself.